The essence of Kataragama is tightly woven with Lord Murugan, God of War, Love and Beauty who is also known by the names of Skanda and Kataragama Deviyo. He is considered to be the second son of Lord Shiva and Parvathi and the brother of Lord Ganesh. As such, an intriguing legend encircles his arrival to Kataragama, which starts with Lord Murugan's departure from his home due to a dispute with his brother. His journey carried him southwards, destroying asuras (divine beings considered to be evil) along the way, and winning the hand of Devayanai (Theivanai), daughter of Indra, in marriage. However, not stopping there, Lord Murugan proceeded to Sri Lanka in his quest to destroy Surapadma, an asura, where he met and married Valliamma, daughter of tribal (Vedda) chief by the name of Nambi, thus gaining a second consort. As time went Devayanai, anxious to see her Lord's return sought an envoy willing to travel to Sri Lanka in search of Lord Murugan. The emissary who came thus to the Island was Kalyangiri, an ascetic who suffered great hardships without any sleep, day and night, for 12 years in the hope of seeing a vision of Lord Murugan. In his time of devotion, a Vedda boy and girl kept him company attending to his needs. However, at long last growing weary Kalyangiri fell asleep and was promptly disturbed by the Vedda boy. Annoyed he chased the boy who ran to the Menik Ganga where Kalyangiri was favoured with Lord Murugan's vision. Overjoyed and not forgetting his task, Kalyangiri was about to plead the Lord to return to Devayanai when Valli begged him not to separate her from Lord Murugan. 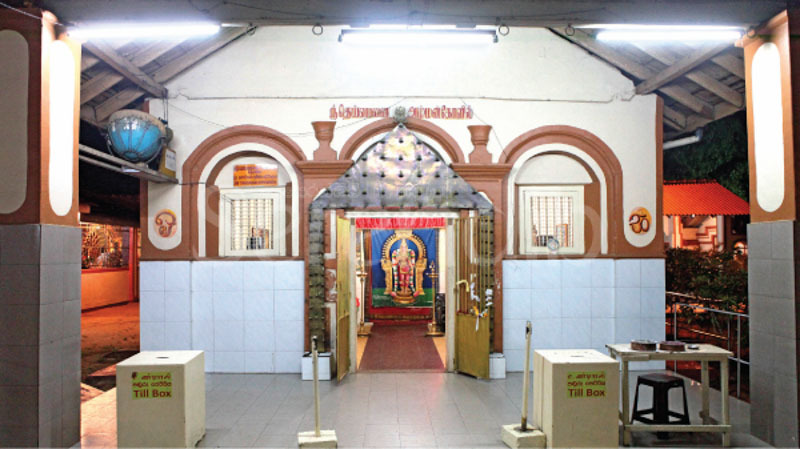 Yielding to her wish, Kalyangiri decided to remain in Kataragama where he went onto build a temple to Devayanai and the Kalyana Mandapa (the main shrine long ago) where the Shatkona Yantra was placed. And the Yantra that is enshrined and worshipped in the Maha Devalaya by thousands to this day is said to be the Shatkona Yantra. It is believed that this Yantra is infused with Sadakshara, the mantra of Skanda, and is overwhelmingly powerful aiding the pilgrims and devotees with its compelling spirituality. Further chronicles in history show that the temple of Kataragama could have been built by King Dutugemunu as a fulfillment of a vow made in the wake of the successful defeat of King Elara around 300 BC. With a pooja vatti or a tray of offerings, which contained a variety of fruits, a garland and betel leaves, we proceeded to the hallowed grounds of the Devalaya. On the way we observed a group of people performing ablutions in the Menik Ganga as is the centuries long tradition before entering the Devalaya. Continuing on, soon we were surpassing countless others carrying pooja vatti atop their heads in much reverence. Some devotees even forgo meat, spirits and all other deeds deemed as vices in Buddhism and Hinduism to showcase their intense devotion. Before progressing to the Devalaya, as customary devotees first worship Kiri Vehera, situated a short distance away from the Maha Devala premises. 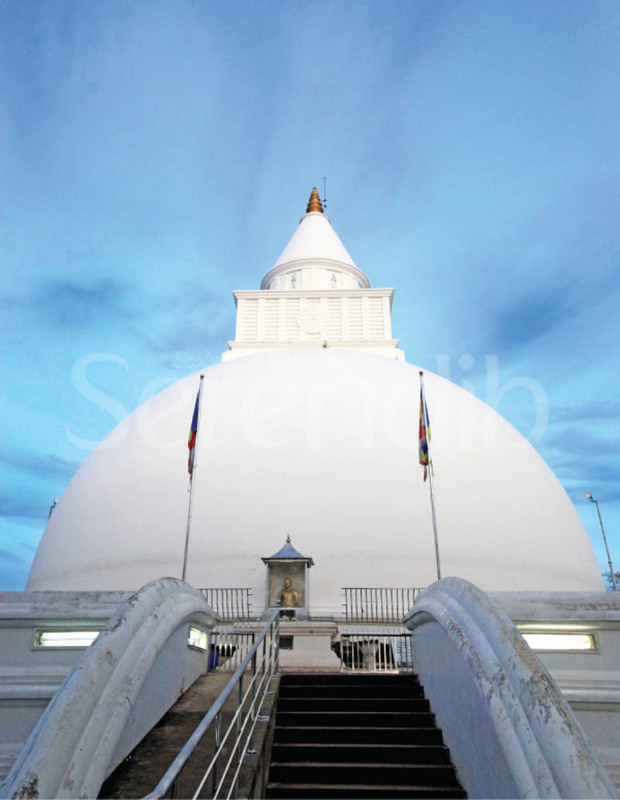 It is surmised that the Kiri Vehera was built by King Mahasena commemorating Lord Buddha's visit to Kataragama. Going through the massive archway that read Ruhunu Maha Kataragama Devalaya, we joined the queue that stood to the side of the Maha Devalaya to await our turn to go inside with the pooja vatti. To the left hand side of the Devalaya was the temple of Lord Ganesh and a Buddha Shrine. The Kitchen where all the offerings to the gods were prepared was in the other side while behind is the sacred Bodhi tree, said to be an Ashtapala-one of the first saplings from the Bodhi Tree brought to the Island by Arahat Sangamitta Theri. Stone pathways lay between each of the devalas and a Kapurala, a priest in the service of Lord Murugan, unrolled a red ‘pavada' or carpet while yet another started to rope out the area, bidding those who wishes to step inside the Devalaya to do so now as they would be unable to enter once the pooja or ‘thevava' starts. As is the custom of any ritual that involves Hindu gods, the ceremonies are initiated with the worship of Lord Ganesh, god of wisdom and new beginnings. It is believed that Lord Ganesh fulfills all hopes and removes all obstacles. As such, crowding into either sides within the small room, we waited in anticipation for the pooja to start. 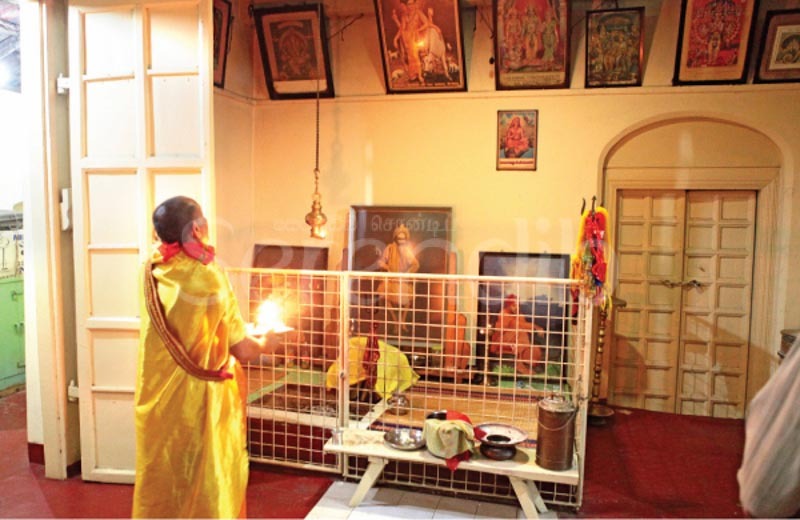 The room was sectioned into two segments-the side where the devotees stood and the area where only the priests were allowed to enter. A cloth with a painting of Lord Ganesh covered the entrance that led to the shrine housing the moorthi, statue, of the Lord. Soon the sound of the daula, and the horanewa reached our ears and the priest signalled to those in front to ring the bells that hung in a row. It is said that the bells are thus rung to invoke the gods and to seek their attention. The priest was attired in a white vetti over which a red cloth was wrapped while a yellow cloth was tied around his neck like a cape. Further his nose and mouth were also covered with a yellow cloth so as to ensure the cleanliness of the offering. First the priest offered chandanam (sandalwood), flowers, garlands and prasad (sweetmeat) to the Lord before commencing the aarthi, a special pooja for God Ganesh that involves offering the light from wicks soaked in ghee. Aarthi is conducted three times in the evening and morning. The pooja involved the priest continually going to the area beyond the cloth, coming out to pay respect with the Aarthi tray by first holding the tray to the feet, then the heart and face of the painting of Lord Ganesh. Special mantras were recited throughout each of the items offered to god while at the very end a conch shell was blown. Afterwards the priest carrying a tray with vibhuti (holy ash), sandalwood and theertam (holy water), approached each devotee to bless them. As he approached, we put our hands together in reverence and bowed our heads to receive the Vibhuthi and the ‘pottu', after which we extended our hands to receive the holy water, which we drank and placed on our head completing the ritual and receiving the blessings of Lord Ganesh. After the pooja, we reached the altar to make an offering to the god where the priest proceeded to tie a kalava or mauli (a sacred thread) on our hand reciting the mantra, sarva badha vinirmukto dhana dhanya sutanvitaha manushyo matprasadena bhavishyati na sanshayaha, which we were later told was a chanting for wealth and good luck. Stepping inside the Maha Devalaya, which was much bigger than the other shrines, we eagerly looked about. Yet again we were confined to the sides of the room, leaving space in the middle for the ensuing ceremonies where one side consisted of those carrying the pooja vatti while the other of worshippers that did not. Paintings of Lord Murugan and his consorts decorated every inch of the wall. Here also the devotees were ringing the bells located on either sides with much fervor while two kapuralas continued to play the daula and the horanewa respectively without missing a beat. 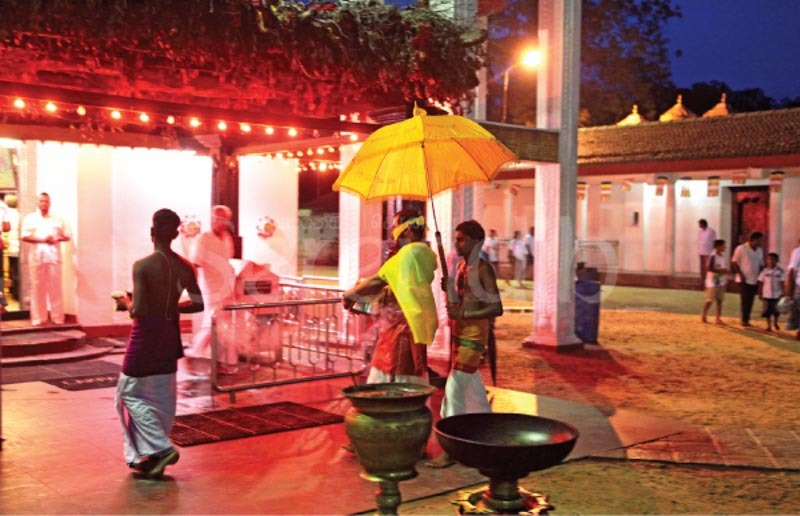 Outside, the main kapurala, Sudu Mahattaya, proceeded to carry the Buddha Pooja, offering of food to The Buddha, under the udu viyana (awning) to the Buddha Shrine stepping over the pavada. In contrast to the temple of Lord Ganesh, the Maha Devalaya of Lord Murugan comprised of many kapuralas attired in complete white. There are 18 kapuralas in the service of Lord Murugan, divided as Kuda and Maha Bethme Pila depending on the nature of their jobs. 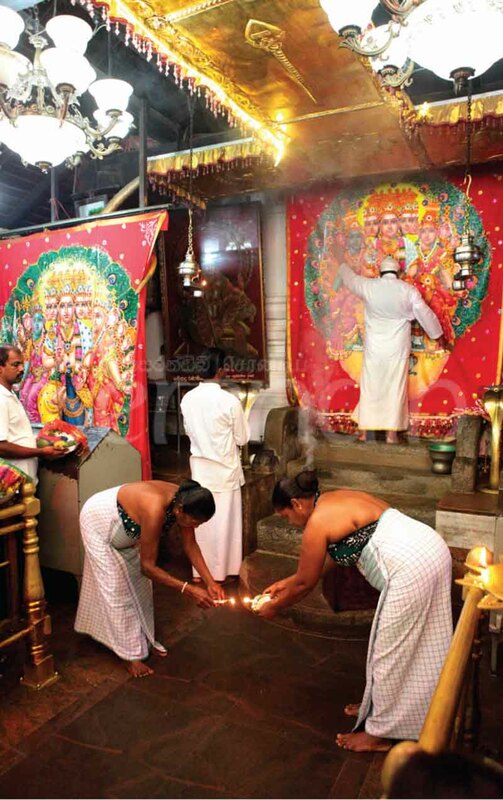 Inside the Devalaya, before offering the muluthan pooja, two women dressed in what appeared to be ethnic garb stepped along the pavada carrying two small clay lamps, which they laid down on the steps leading towards the main shrine. The ritual called the ‘pahan pooja' conducted by ‘alaththi ammala' is said to have been carried over for centuries by the descendants of the Vedda tribe, who have revered Lord Murugan as Kande Deviyo. Afterwards Sudu Mahattaya proceeded to bring what seemed to be a pole tied with vibrantly hued sacks on either sides, called the muluthan kanda, to the Maha Devalaya to offer the Muluthange pooja (offerings made to gods). Going up the few steps, he slipped into the main shrine room beyond, which is covered by a painting depicting Lord Murugan. Once the offerings of the muluthange pooja was completed Sudu Mahattaya stood at the top step of the entrance facing the painting of Lord Murugan to perform a ritual of blessing. He spread his hands diagonally and around, at times almost touching the painting, mimicking a worship that was fascinating and at the same time conveyed a deep sense of spirituality that seemed to evoke the blessing and reverence of a culture, that perhaps has been kept alive for time immemorial. The bells and the drums reached a crescendo while the prayers of the gathered rose to match the unfolding reverence. Once the pooja was over, the kapuralas went around placing vibhuthi, giving holy water and muluthan bath, warm and sweet tasting, to each devotee. Further the pooja vatti was returned to the devotees as well with left over fruits that all shared amongst the gathered to receive the blessing of the Lord. The tolling of more bells called us to go beyond the gates of the Maha Devalaya. We first reached a shrine dedicated to young Lord Murugan (Palani Murugan) where a priest continued to go back and forth, three times in total, offering aarthi first to a painting hung on the far corner to the entrance of the main shrine, then to another painting hung to the right hand side and then to a vel embedded and enclosed amidst a fence. An interesting story revolves around the young Lord Murugan. Lord Vishnu had come to the abode of Lord Shiva in Mount Kailasa, India with a rare mango that caught the attention of Lord Ganesh and Murugan prompting them to compete. Lord Shiva presented the condition that whoever goes around the world first would be able to gain the mango.  Swiftly Lord Murugan scrambled onto his Mayura Vahana (peacock vehicle) and journeyed around the world without paying heed to Sage Narada who inquired regarding his urgency. However, Lord Ganesh who remained behind due to his inability to travel in his small Mushika Vahana (rat vehicle) was able to gain the guidance of Sage Narada. As such he went around his parents three times saying that they were his world and won the mango. When Lord Murugan returned after his journey and upon seeing the mango in the hand of Lord Ganesh fled Mount Kailasa, initiating his journey southwards. 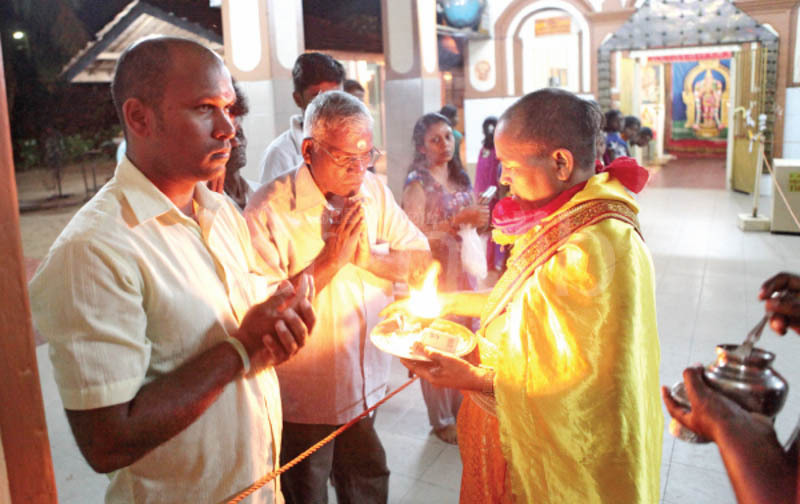 By now the priest had begun the second pooja, which was performed at the Theivanai Amman Shrine located to the right hand side. 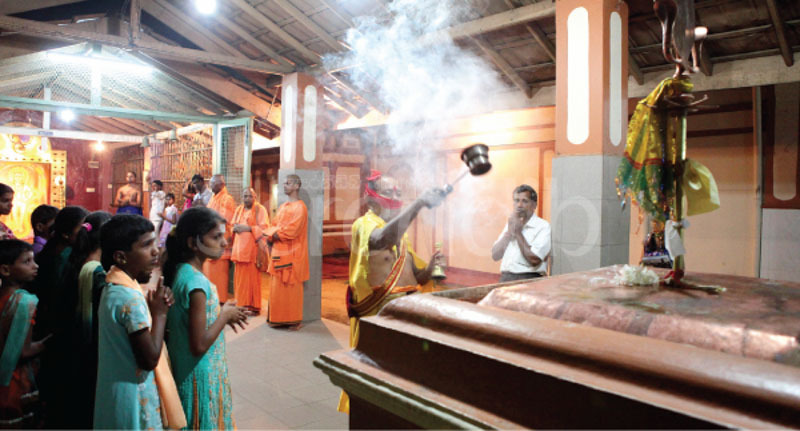 Right across this shrine was the Guru Asanam that houses the remains of several sages that had once resided in Kataragama. 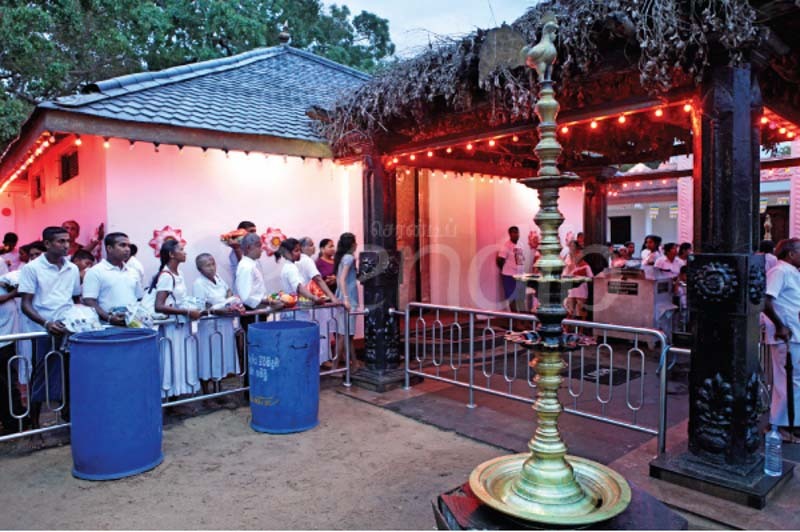 Devotees filed inside the small shrine dedicated to Goddess Theivanai while more gathered outside. 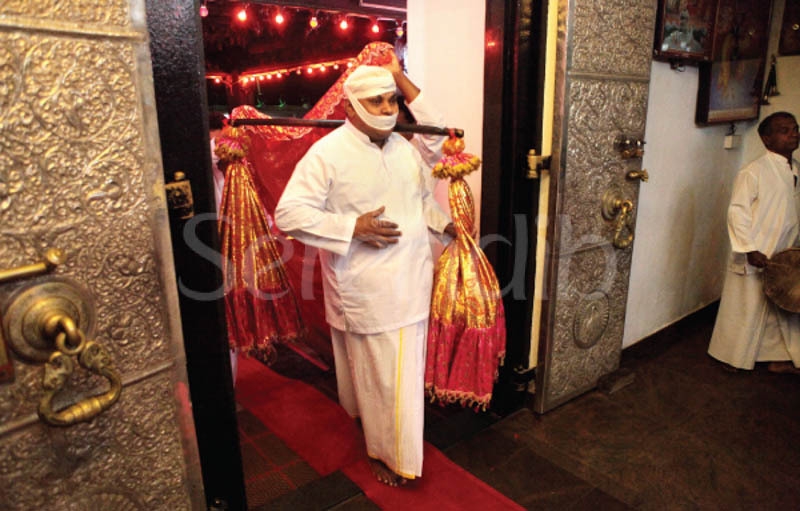 The priest after completing the pooja inside the Theivanai Shrine proceeded to the Guru Asanam to offer his respects. Afterwards the whole entourage moved to the Sri Vairavar Kovil where the final pooja was conducted finishing the Kataragama pooja for the day. 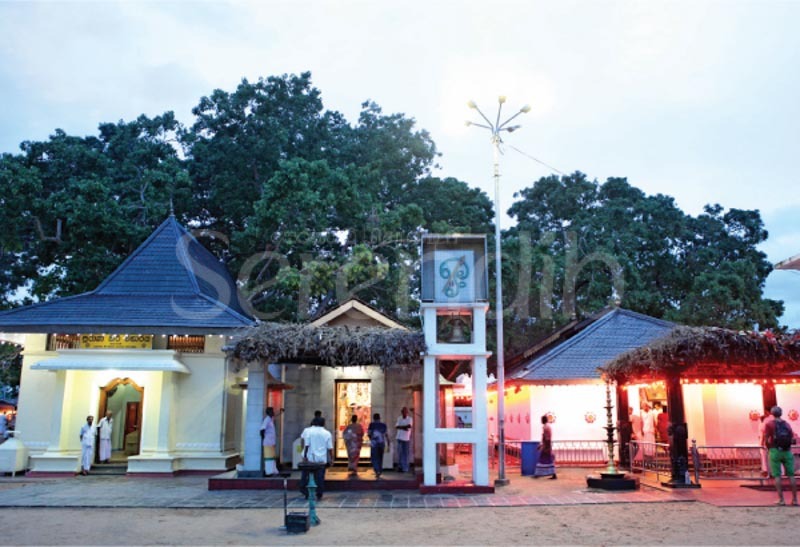 Kataragama Devalaya holds three pageants during the course of the year-the Esala Perehara, the Il Perehara (Full Moon day in November) and the Aluth Avurudu Perehara (April). 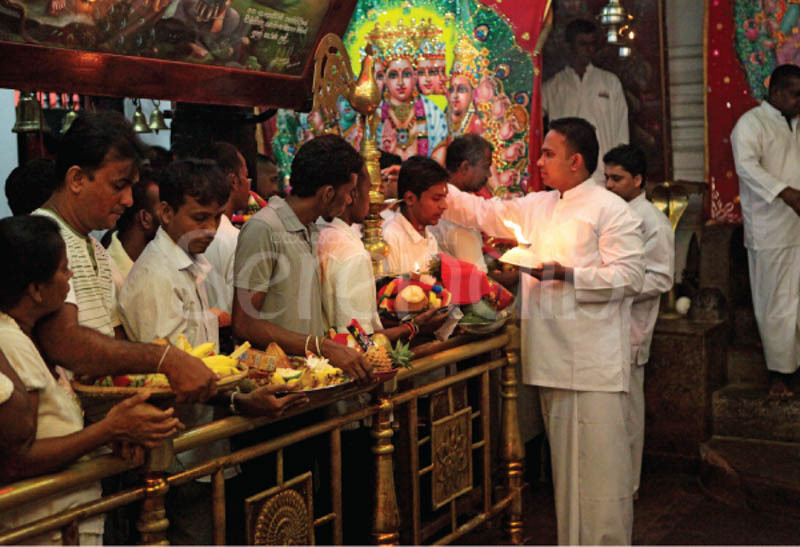 Held in July/August for 15 days, the Esala Perehara takes precedence as one of the most colourful and culturally and spiritually significant events in Sri Lanka.